Electric cars are becoming more prevalent in every day life, so would it be that uncommon for hobbyists to begin tinkering with their new automotive toys? One particular Canadian company has already started, gutting the contents of a Tesla Model S P85 and stuffing it into a kit car - and it's beyond quick. We've seen fast Teslas before, and even classic electric retrofits - but this is a new kind of fast that we weren't expecting. 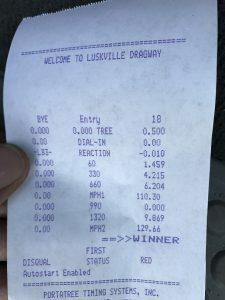 EV Controls drove their 818 kit car out to Luskville Dragway in Quebec, Canada to have some fun. After putting over 5,000 kilometers (around 3,100 miles) on the car over the summer without problems, they decided it was time to see what the car could do at the strip. Coupled with the drivetrain of Tesla's Model S P85 and two battery packs from a Chevy Volt, the car was able to blaze down the track at some impressive speeds. When we say that this car is quick, we mean that it's properly quick - enough to put a scare on most opponents who dare to line up to it at the track. The time slip of the run shows its ability to cover all 1,320 feet in just 9.869 seconds, trapping 129 mph. That's more than a second quicker than a P100D with Ludicrous mode. EV Controls achieved this by modifying the Tesla's firmware to work with their own T1-C controller, which together produce about 530 horsepower - about 60 horsepower more than the stock motor outputs. Thanks to the platform being a kit car, the company was able to shave off around 2,500 pounds versus a traditional Model S, bringing its weight to a much more conservative 2,100 lbs. What might be even more impressive is that the car was driven to the track and was still able to make these passes on its charge. The lightweight setup coupled with gobs of power and instant torque makes this similar to stuffing a modified LS1 into a Mazda Miata, albeit a different noise from under the hood. But if there's one common factor between the two, it's speed.